Picture frames aren't limited to just pictures and artwork. There are so many clever picture frame crafts to try that can make your home more functional and beautiful. The best part is that these crafts are inexpensive, and the majority of them can be created in just a couple of hours. This picture frame project is easier to complete if you're working with an existing shadow box, but that's not necessary. Any frame can be turned into a shadow box by adhering wood pieces to the backside of the frame. It can seem costly to transform almost 10 frames into a terrarium, but it doesn't have to be. In fact, head to the dollar store and pick up inexpensive frames for a buck. To make them look more expensive, spray paint them a matte color of your choosing. To adhere the frames together to create a box, use hot glue and duct tape. The only thing you need to do to convert a frame into a jewelry holder is to replace the backing with some type of mesh. This blogger used clover leaf radiator grill from a local hardware store for her backing. For more style, consider spray painting the frame a fun color that will match your existing decor. 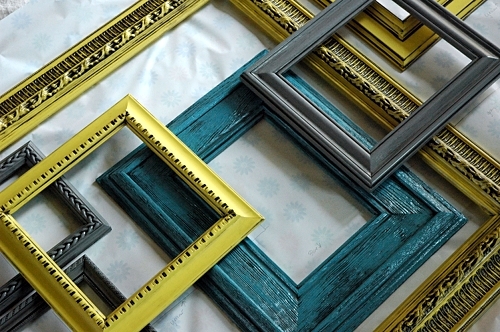 If you have a bunch of old, empty frames laying around, consider turning them into a large-scale piece of art. Layer the frames randomly then connect them together using a strong adhesive and finishing nails. The finished project will look great on a large empty wall or above a sofa. Who doesn't have more than one device to keep charged? The great thing about this picture frame project is that you can look at your devices upright while they're charging. An added bonus is that all the cords will be tucked away behind the frame and out of sight. One of the simplest projects you can do with a frame is to turn it into a dry erase board of sorts. All you need to do for this is replace the backing with a fun printed paper or fabric. Then, use dry erase markers to write lists directly on the glass. The best way to anchor a centerpiece on a table is to use a tray. Instead of buying a specialty tray, consider making one using a frame. This way, you can change out the bottom portion of the frame to go with each season and various centerpieces. If all you have of an old picture frame is the frame itself with no backing or glass, consider this project to spruce it up. Distress the frame, then use twine and mini clothespins to create a rustic photo collage. There are many ways to add hooks to a frame to create a key holder, but this one is especially crafty. You can collect antique trinkets or buy antique-style locks from a craft store. Either way, the end result is a whimsical way to hang up your keys at the end of the day. If your furniture is too modern for your traditional or farmhouse decor, consider upgrading it with frames. The right size frames can act as molding to immediately update a piece and make it seem more expensive and fitting to the space. 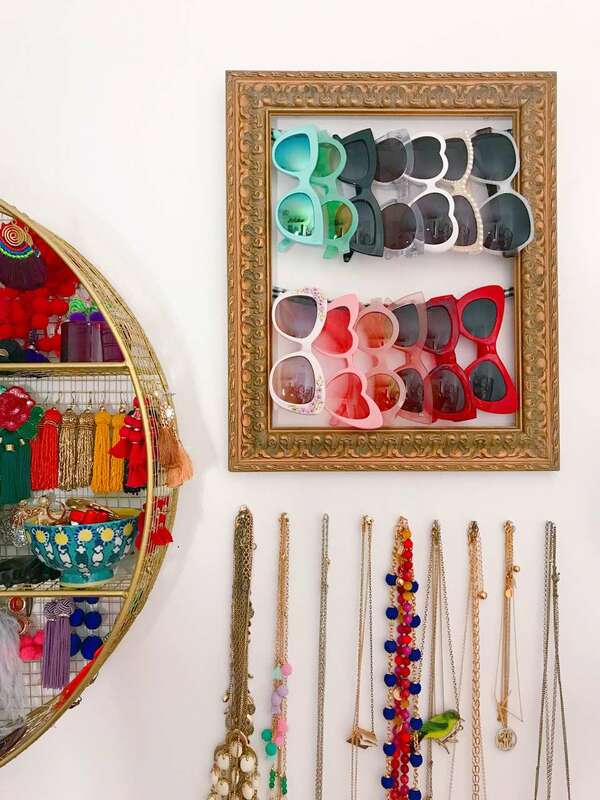 If you're one of the many people that own more than two pairs of sunglasses, consider utilizing a frame to keep them all on display. To protect your sunglasses a bit more, opt for a shadow box frame that is at least an inch or two thick. Creative garden spaces can be made more creative by incorporating reclaimed and found objects throughout. One clever way to do this is by using old wooden frames as a literal frame for a hanging basket. From a distance, the frame looks like its housing a beautiful piece of art when in fact it's just housing a piece of nature. To turn a frame into a functional tray, the first thing you need to do is pick a backdrop for the bottom section. This step can be done using anything from contact paper to fabric. Next, figure out what you want the handles to be made out of and how you are going to attach them to the ends of the frame. This fun picture frame craft is ideal to make with your kids around the holidays. Get them involved by encouraging them to stamp the number of days on the individual cards. To take the craft one step further, consider writing an activity or type of reward on the backside of each advent card. The thing that is wonderful about this command center idea is that it includes hooks for backpacks, coats, and other items that can clutter an entryway. Using a large enough frame will not only ensure that your families' tasks stay organized, but their mudroom belongings do as well.